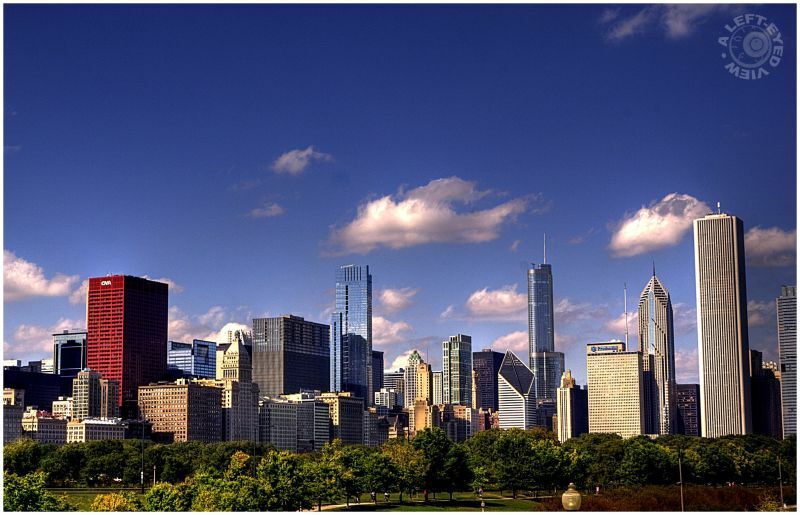 Steven (Chicagoland, United States) on 4 November 2009 in Cityscape & Urban and Portfolio. The second of three plates of the Chicago skyline captured from the Museum Campus. Continuing to identify the buildings, left to right, is the CNA Center (red building), Mid-Continental Plaza, tall blue building unidentifiable, Pittsfield Building, The Heritage at Millennium Park, Leo Burnett Building, Smurfit-Stone Building (diamond formation at top), Trump Tower, One Prudential Plaza, Two Prudential Plaza, and Aon Center (square tower). Perfect again and I can't wait to see it stitched together with the others! Nice cityscape. I like the industrial look. Nice shot - the CNA really pops out, doesn't it? Yes, another super skyline Steve. that reddish building on the left is a perfect visual balance of color for this wonderful blue sky! What a lovely afternoon you had to shoot this. stunning shot - excellent cityscape! Wow I love this view Steven !! Trump puts his towers all over. :-) This is a very beautiful skyline with that gorgeous sky in the background. These city shots blow me away! REALLY good! Fantastic colors with this skyline! The air looks so amazingly clear and clean. And again, a great skyline shot. I like the different colors and geometric shapes of the buildings.